This year�s mermaid-themed Cardfight!! 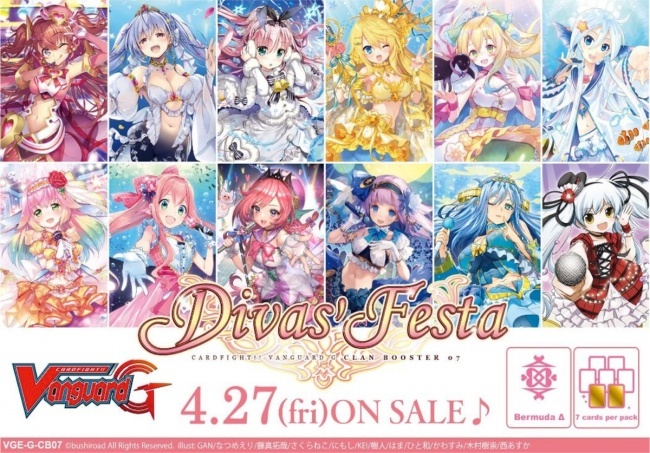 Vanguard G expansion is coming a bit earlier, with Bushiroad releasing Divas� Festa on April 27. The cards in Divas� Festa will only include Bermuda Triangle clan cards, and are designed to work well with the Debut of the Divas Trial Deck and the Prismatic Divas boosters that released last year (see �Mermaids Return to �Cardfight!! Vanguard G��). The set will include new �Chouchou� themed cards, a reissued version of Superb New Student, Shizuku, and a Bermuda Triangle version of Zeroth Dragon of Distant Sea, Megiddo. Altogether, the set has 50 card types, with 49 new cards and 1 reissued card. The rarities will be 1 ZR (reissue), 1 GR, 8 RRR, 10 RR, 13 R, and 17 C. There will also be 12 parallel SP cards and one Special Reissue card, featuring alternate crown-themed artwork. The cards will be packed in seven-card boosters with two R or higher rarity cards in each booster. Boosters will be sold in 12-pack displays. To support the release, Bushiroad is planning a Sneak Preview event the weekend of April 20 � 22. Participating retailers can order the Divas� Festa Sneak Preview Kit, which includes 39 boosters, 9 promo cards, and 2 premium rubber playmats, enough materials for eight participants. Divas� Festa will follow the Divine Dragon Apocrypha set, releasing on March 9 (see �Dragon Deities Descend in �Divine Dragon Apocrypha��).